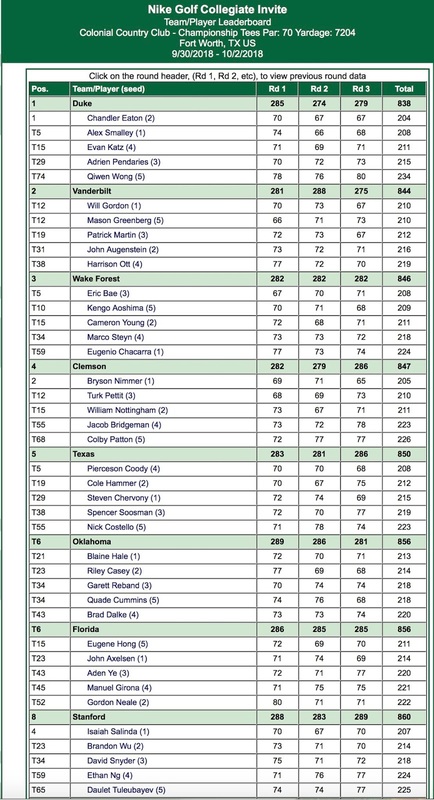 FINAL RESULTS - Sparked by senior Brandon Wu's sixth-place showing, No. 28 Stanford concluded its fall season by placing ninth Sunday at the Golf Club of Georgia Collegiate Invitational. Wu fired rounds of 70-67-73 to wind up at 6-under 210 at the Lakeside Course at The Golf Club of Georgia, eight strokes behind winner Justin Suh of USC who shot 14-under 202. The Trojans captured the team title with a 54-hole total of 22-under 842, one better than Clemson. 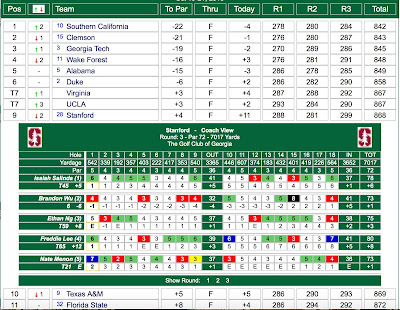 Stanford (288-281-299) finished at 4-over 868. "We had a tough final round but there were some very good moments," said Conrad Ray, the Knowles Family Director of Men's Golf. "Our consistency needs to be improved during the off-season and we need to work on production throughout the lineup." Final round team scores and Stanford scorecards - click on image to enlarge. Wu recorded three front nine birdies and earned the outright lead early on the back nine but was overtaken. He registered five birdies to collect his ninth career top-10 finish. Wu finished second in event as a sophomore and 12th last year. Junior Nate Menon had a strong tournament, putting together rounds of 71-72-73 to claim a share of 21st at even-par 216. He eagled the par-5 ninth hole and added four birdies. Senior Isaiah Salinda (73-70-78) tied for 45th at 5-over 221, while freshman Ethan Ng (77-72-77) tied for 59th at 8-over 224. Fellow frosh Freddie Lee (74-74-80) shared 65th at 12-over 228. "We have a lot of work to do with a relatively young team and the guys are up for the task," Ray said. Stanford resumes competition at the Amer Ari Intercollegiate, February 7-9 in Kona, Hawaii. ROUND TWO RESULTS - Stanford improved three spots on Saturday in the second round of The Golf Club of Georgia Collegiate Invitational at The Golf Club of Georgia. The Cardinal combined for a 7-under-par score of 281 – tied for fourth-lowest on the day – and moved from 10th to seventh heading into Sunday's final round. 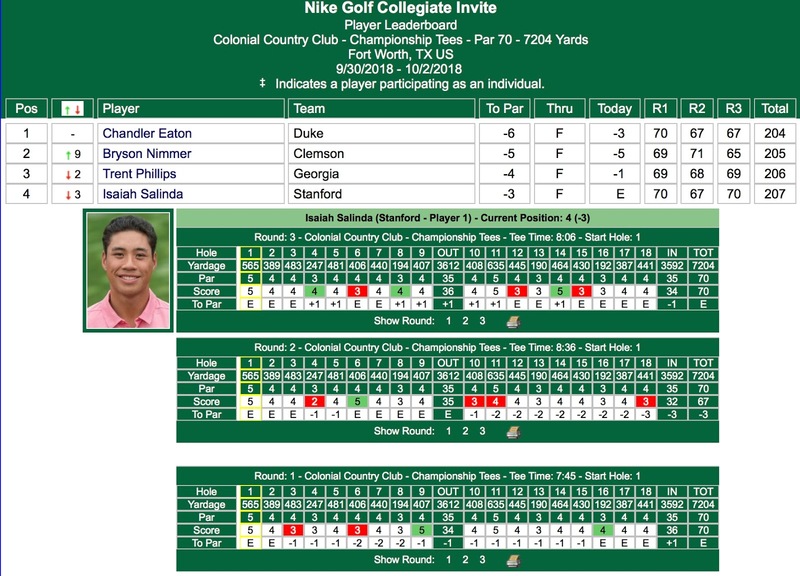 Stanford has a 36-hole total of 7-under 569, 13 strokes behind pacesetter Clemson at 20-under 556. Team scoring is shown below - click on image to enlarge. For the second consecutive round, senior Brandon Wu led the Cardinal with a 5-under 67. He forged six birdies and is tied for third in the individual competition at 7-under 137. Justin Suh of USC leads at 10-under 134. Stanford also received a sub-par round from senior Isaiah Salinda, who tallied six birdies to shoot 70 and is tied for 21st with teammate Nate Menon (72) at 1-under 143. Menon, a junior, added four birdies. Freshmen Freddie Lee (148, +4) and Ethan Ng (149, +5) are tied for 53rd and 57th, respectively. 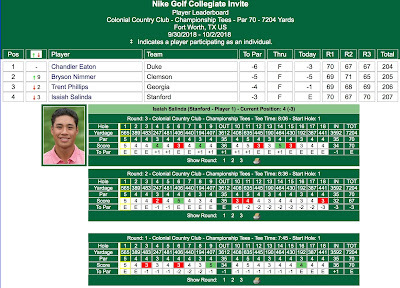 Stanford round two scorecards are show below - click on image to enlarge. On Sunday, the Cardinal plays with Virginia and Texas A&M. Ng leads off at 8:30 a.m. ET, followed by Lee (8:41 a.m.), Menon (8:52 a.m.), Salinda (9:03 a.m.) and Wu (9:14 a.m.). ROUND ONE RESULTS – Stanford combined for a first-day score of even-par 288 on Friday and sits in 10th place at the Golf Club of Georgia Collegiate Invitational. The No. 28 Cardinal is one of 14 teams competing in the 54-hole event at The Golf Club of Georgia. Host Georgia Tech earned the early lead with a score of 18-under 270. Playing in the final tournament of the fall season, the Cardinal got off to a fast start, sparked by freshman Ethan Ng's eagle on the par-5 first hole. Stanford reached 9-under on the front nine but was unable to sustain its torrid pace. Senior Brandon Wu paced the Cardinal with a 2-under 70 and is tied for 15th. Two of his six birdies came at the 15th and 18th holes. Junior Nate Menon used four birdies to shoot 71 and is tied for 25th, while senior Isaiah Salinda posted a 73 to gain a share of 36th. Freshman Freddie Lee (t-43) and Ng (t-59) shot 74 and 77, respectively. 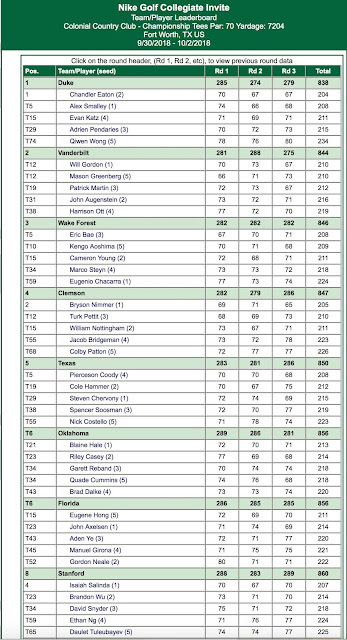 Round one scorecards for Stanford are shown below - click on image to enlarge. 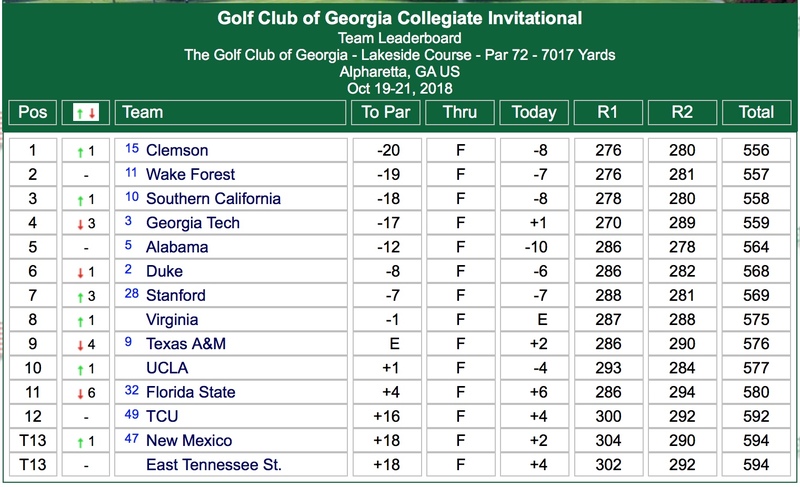 Noah Norton of Georgia Tech is the individual leader after firing a 65. In a rain shortened event between 8 teams, Stanford ended with a split of its two matches. The Cardinal lost the first match against South Carolina 4 & 2 and swept the second match against Kent State 6-0. The second match was started on day one but rain ended play for the day, and the match was finalized on day two. Sophomore Henry Shimp and sophomore Ashwin Arasu led the way by each winning both of their matches. The other four team members split their two matches. "Great work yesterday afternoon and today by the guys against a quality Kent State Team," said Conrad Ray, the Knowles Family Director of Men's Golf. "We had a better feel for the course in our second match and all of the games got off to a fast start. It was a great learning experience to be able to play this format on a world class course with something on the line." Stanford's 8 total match points tied for the best finish among the eight teams with Georgia. The two match results for the Cardinal are shown below. The final match was called off due to thunderstorm activity in the area. Muirfield Village Golf Club was designed by Nicklaus, whose 18 major wins are the most in golf history. He is also host of the Memorial Tournament, an elite PGA Tour event played at Muirfield each year. "We were thankful for the opportunity," Ray said. "It was also an honor to spend time on a course that honors the legacy of Mr. Jack Nicklaus." The Cardinal returns to competition on October 19-21 at The Golf Club of Georgia Collegiate Invitational in Alpharetta, Georgia. The 15-team, 54-hole tournament will be contested at The Golf Club of Georgia. DUBLIN, Ohio – Stanford will compete in its third fall event Monday and Tuesday at the Jack Nicklaus Collegiate Invitational at Muirfield Village Golf Club. Eight teams will participate in the unique match play tournament. Six players from each school will play, with one point available per match. The Cardinal oppose South Carolina on Monday morning at 8:30 a.m. ET. The winner will take on either Georgia Tech or Kent State at 1:30 p.m. ET, with the losers facing off at the same time. The other first-round matchups are Georgia versus Florida State and host Ohio State against Clemson. Final round matches will be contested Tuesday morning. Stanford will be represented by Brandon Wu, Isaiah Salinda, David Snyder, Ashwin Arasu, Henry Shimp and Ethan Ng. The course was designed by Hall of Famer Jack Nicklaus. It annually hosts the PGA Tour's Memorial Tournament, hosted by Nicklaus. Temperatures are expected to be in the mid-80s and there is a 40 percent chance of thunderstorms Monday afternoon.